Winter is here, and I’m in full baking mode. I honestly don’t even enjoy baking all that much, but at this time of year, something makes me want to fill the house with smells of cakes, cookies, and fresh baked bread. Having some fun with seasonal ingredients, I used my favorite basic chocolate chip cookie recipe from Smitten Kitchen and made a few changes. I like to double (or sometimes triple) the recipe, then flash freeze the cookie dough. Whenever I need to make freshly baked cookies, I can take a few or a dozen out and bake them up in a flash! Preheat your oven to 325 & line a cookie sheet with parchment paper. In a medium bowl, cream together the melted butter, brown sugar and white sugar. Add the egg and vanilla, and continue blending until creamy. Sift the flour, baking soda, salt and salt into the bowl, and mix with a large spoon just until combined. Stir in the chocolate chips. Cover with plastic wrap and sit in the fridge. 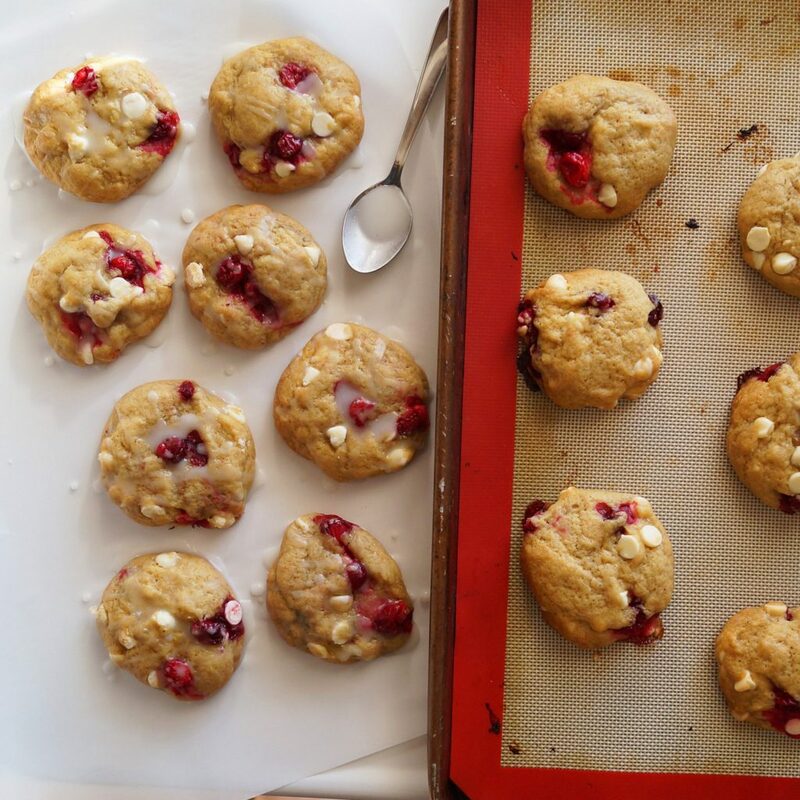 Form golf ball sized rounds and add 3-4 frozen cranberries at a time to each ball as you form it. 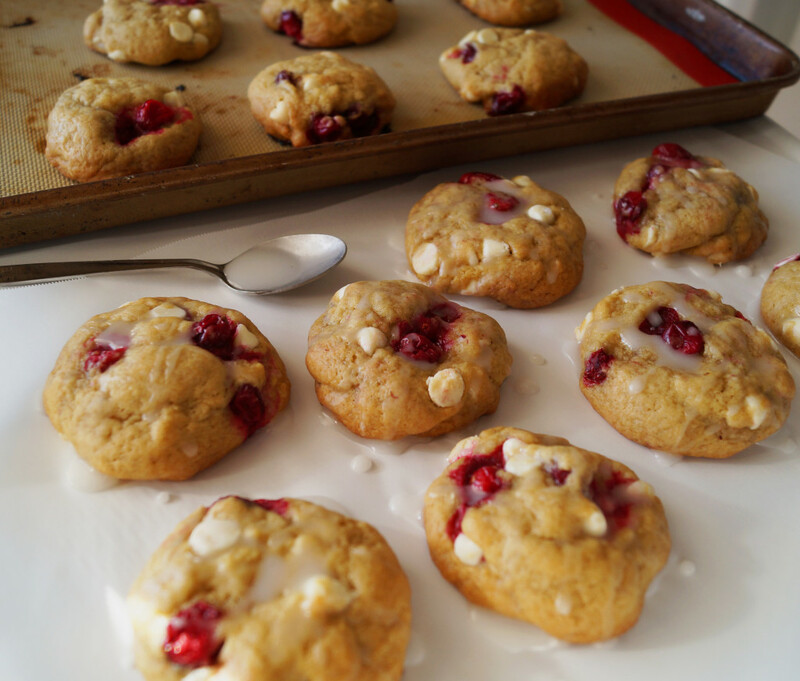 Freezing the cranberries and combining them as you roll the dough balls will keep cranberries from popping in your hands and spraying all over your face, clothes, and kitchen. Lesson learned the hard way. Space evenly on the parchment and bake for 12-16 minutes, depending on size. Once cooled, whisk together the glaze ingredients and spoon over the cookies.